When I first ordered this top, I wasn’t sure I would like it. As a large-chested lady, I try to avoid puffy sleeves or anything that isn’t fitted – generally those items make me look bigger than I am. 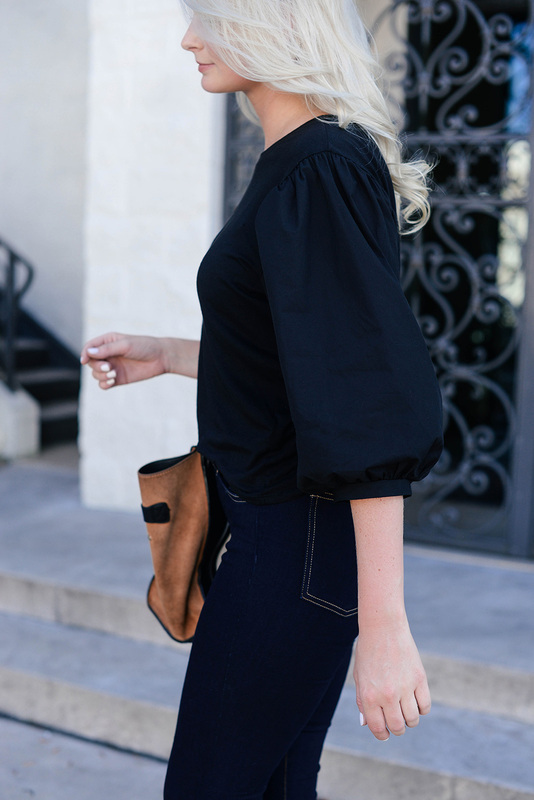 But I really loved the idea of adding another statement staple tee to my closet, since my Victoria Beckham ruffle sleeve tee has been so useful and I’ve gotten so much wear out of it! I snagged this already budget-friendly top during the Anniversary Sale, so it was a total steal. I ordered both the black and white versions to see which would look best, and the black won that game easily. The sleeves on the white version almost looked sheer, giving it a cheaper look overall. The black one did not have that problem! I ended up keeping it after some internal debating and I’m so glad I did! Topshop runs small, so I sized up with an eight – it fits great! While the top is no longer on sale, it’s still only $45 – such a great price point even at full price! This MANGO top has a similar puffed-sleeve look to it, but with ties at the sleeves and it’s under $30! This pintuck blouse comes in two gorgeous fall colors + white for those of you who prefer the basics. Love the unique ruffle detail on this easy tee. The placement is not where you’d expect the ruffles, but it’s a great idea! This flared-sleeve tee looks super soft and comfy, but sophisticated enough for office wear. This long-sleeve tee reminds me of the Club Monaco sweater I just bought. So pretty! Adore the cinch-side detail on this soft tee! This inexpensive blouse comes in three great colors and would be a nice everyday work staple. 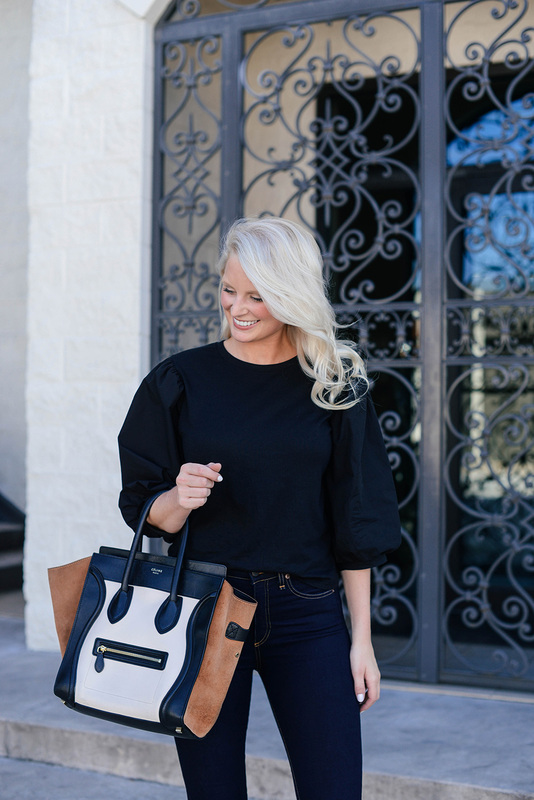 The bow detail on this creamy blouse is to die for! PS – I’ve gotta point out these skinny jeans from Veronica Beard… are they not the most flattering?! I’m so obsessed and can guarantee you’ll be seeing a lot more of these as we head into fall. They are the perfect dark wash and the fit is incredible. They are super comfortable and feature some stretch, but after wearing them for several days in a row (seriously) they haven’t stretched out at all. They really do bounce back. They’re also really long, which is great for us tall gals! Highly recommend these jeans!! I’m wearing a size 28. Love this simple outfit and these jeans fit so well. The simplicity of this outfit is why it is so chic! So gorgeous!